I am not a big collector of Chrome. I'll take any and all Chrome cards that fir my collection (Sox and binder collections), but I never try to complete a set. As nice at the 2015 flagship is, I have zero plans yet again to put the full set together. That is not to say I don't buy a little bit of Chrome here and there. I'll grab one or two rack packs a year, and usually rip a few packs at my LCS, just cuz. That's what I did on Friday and Saturday - rack pack on Friday and a jumbo yesterday. Did ok, though the real scores were found in a monster box at my LCS I was digging through. The rack pack was uneventful. These were the only two cards I added to my collection. Chase is a throwback. The cap logo is the giveaway, though that chain stitched Phillies on his chest really stands out. 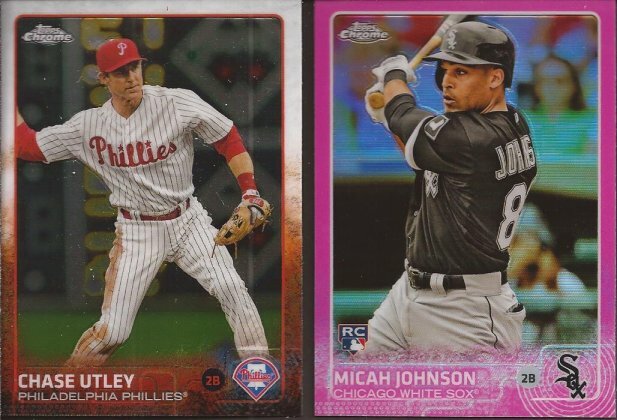 With the racks, you get 3 colored parallels, pink being the hue of choice this year. I'll happily add a Micah, though I am trying to find the Paulie. These three all came from the Jumbo yesterday, and they were all consecutive in the pack. If I was going to get a team hot pack, I couldn't ask for anyone better. Rodon has been a good surprise - let's hope it continues next season. And I like the new refractor thingy. What are they calling this one? Is it still x-fractor? Joc was the card just before the Sox hotness, so 4 decent cards in a row. The jumbo boxes have 5 autos, and I lucked out in the pack I choose. Devon Travis isn't a big name, and as a base auto it doesn't give me much cash. Papoy? Rob Mitchell? Either of you need/want? I mentioned that a monster box loaded with base cards was the best part of the trip. 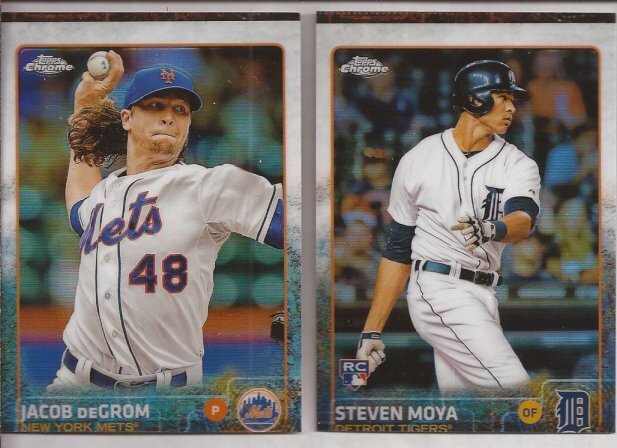 I did find a White Sox card they missed (Eaton) and a DP card (Panik), but these two were a wonderful find. Scanned them with some white area so you can see they are miscuts. I made mention to Brian behind the counter about this and he commented "yeah - getting a lot of miscuts in Chrome this year". If this is true, to you box breakers, I ask you send me those miscuts. Nay - command you!!! Travis is a decent pull. He would have been in the hunt for rookie of the year had he not gotten hurt. 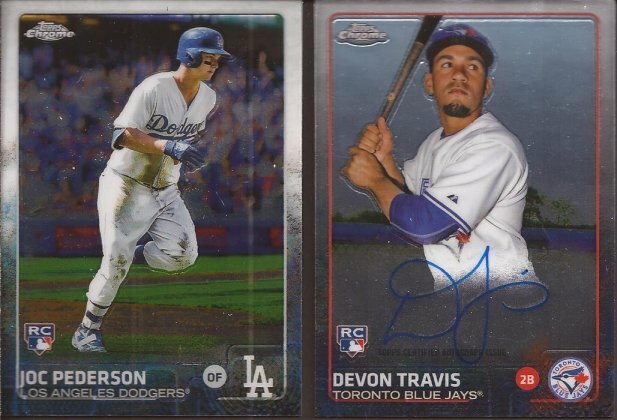 I'm absolutely interested in that Devon Travis auto ! Miscuts? 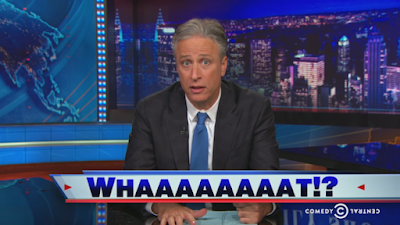 It's 2015! Recalibrate the lasers! "Rodon has been a good surprise - let's hope it continues next season"
I'm not all that surprised that he's been successful. Then again I follow prospects. He was basically going to follow in Chris Sale's footsteps and be the next starter who just zooms through the White Sox farm system. Hence why he was a candidate to be a first overall pick before others like Aiken surged before the draft, and why the White Sox picked him in 2014.